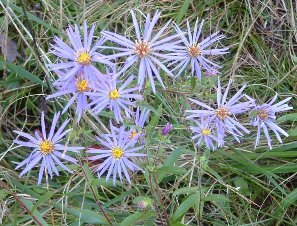 Aster spectabilis. Luba Batuner.www.salicicola.com (Accessed 5/2014). Eurybia spectabilis is a perennial herb from underground stems, 10-90 cm tall, stems usually glandular-hairy. Leaves mostly basal, blade 2-15 cm long, 0.8-4 cm wide, narrowly elliptic, pointed at both ends, margin shallowly toothed, lower and basal leaves stalked, upper leaves smaller and stalkless. Flowers: rays violet-purple, 15-35, 1-2.5 cm long, bracteate base of flower heads 1-1.5 cm long, bracts green-tipped, spreading, often sticky-hairy. Fruit dry, 1-seeded, achene, with tuft of hairs (pappus), wind dispersed. Frequency in NYC: Rare (NYS S2 T). Habitat: Open, dry, sandy soil.